Ever since reading HOBAC’s post on Capucine, I’ve had David Niven on the brain. I thought about him this morning, as I was locked out of the house and forced to extend my run to kill time. I certainly wasn’t going to step foot into so much as a Starbuck’s looking as I did. Mr. Niven took regular exercise, too, you see: skiing and swimming; depending on which of his two houses he was inhabiting — the one in the South of France or the one in Switzerland — he skied or swam. And that jives with the image of him that I have in my head. Skiing and swimming, unless competitive, aren’t generally sweaty pursuits. Would you call him a dandy? The photo at the top of this post shows that he wore his clothes well — that is, he wore them easily– as he would have pyjamas. He also carried himself well. But that is probably a byproduct of his schooling at Stowe and Sandhurst. Well, that and the skiing and swimming. And he certainly spoke well and often with a certain self-deprecating humour. Can you imagine a better tribute than that given by Sir John Moritmer (Of Rumpole fame) who said of his friend: “I don’t think his acting ever quite achieved the brilliance or the polish of his dinner-party conversations.”? 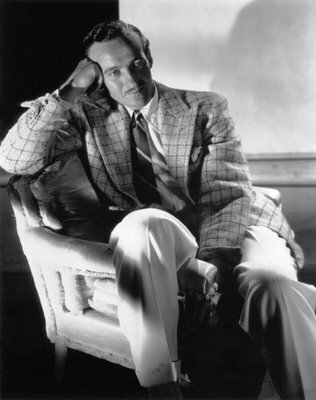 David Niven, actor, producer, director, author, father, husband, Army officer, Legionnaire of the Order of Merit, operator (commandoes and Phantom Reconnaissance Regiment), Academy Award winner… gentleman. This entry was posted in Elegantology and tagged Capucine, David Niven, The Moon's a Balloon, the Pink Panther. Bookmark the permalink. Were you aware that John Mortimer died last week? We were devoted fans of Rumpole. Mortimer was an incredible talent (and actually a barrister himself). I don’t know very much about David Niven, but for one incredible anecdote. While hosting the Oscars, he was faced with a peace-sign flashing full-fledged streaker dashing across the stage. I’m completely paraphrasing here – but he turned to the audience and deadpanned – And all that the world will remember him for is his shortcomings. I can only dream to be so witty under pressure! Nice tribute. The Moon’s A Balloon is one of the funniest books I have ever read. I love David Niven. His clipped vowels, beautiful eyes, elegance and his debonair demeanour. I don’t think there are many actors these days you can say “he is debonair”. My favourite film by him is actually a drama based on a play by Terence Rattigan -it’s called Separate Tables. I have an old copy of The Moon’s a Balloon and just love it. And I have always admired the wit with which he addressed the gentleman who chose to “streak” the Academy Awards whilst he was speaking. Priceless. He was a personification of Elegance, and Ease…Nice tribute, nice post.